Sand filters and diatomaceous earth filters need to be backwashed regularly to keep them clean. Backwashing should be done whenever the pressure increases on the filter gauge, when the water flow decreases or cleaner stops working, or every 2-3 months. 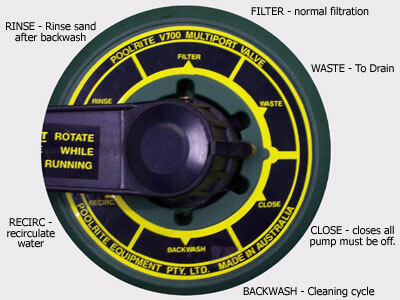 To backwash your filter simply turn the multiport valve handle (the handle on top or beside the filter with a number of options such as Filter/Rinse/Waste etc). Make sure the pump is off (never turn the valve with the pump on). Turn this handle to the backwash position . Then switch on the pump. This will wash water through the filter washing any dirt down the drain. You should be able to see this water through either a sight glass on the valve or through a clear section of pipe, otherwise watch the water pouring into the drain. When the water starts to clear, switch off the pump and turn the handle to rinse. Run the pump on rinse for approximately one minute to rinse any disturbed dirt from the filter so it does not go back into the pool. Some older filters may not have a rinse function. Backwash these until the water is clear to avoid sediment returning to the pool. 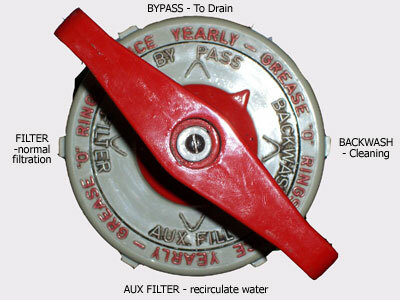 Return the valve to the filter position when finished and your pool can be used as normal. Diatomaceous earth filters need to be thoroughly disassembled and cleaned every 6-12 months. If you find the pressure increases rapidly again after backwashing you may need to disassemble the filter. If you have persistent high pressure problems with a sand filter contact a pool shop for assistance. Properly treated pool water is often better than our tap water. Water conscious pool owners may want to use this water to water lawns and gardens. This should not affect any lawns or native plants. The pH of your pool water is 7.2-7.8 so it may not be ideal for rose gardens or other gardens treated to meet certain pH soil recommendations (through the use of Lime or similiar). Due to the dry drought conditions facing Sydney and NSW at this time we are finding pools are accumulating a lot more loose sediment and dust than normal, especially during periods of high wind. If you have an automatic cleaner you may have to backwash even more often due to these conditions. Your pool may look spotless compared to your neighbour but that will be because all the extra sediment has been collected by your cleaner and sucked up into your filter so your filter will need to be cleaned more regularly. The following diagrams show the most common types of multiport valves.